On 2 November 2000, the Expedition 1 crew to the International Space Station docked with the rapidly growing orbital outpost to begin what has become an uninterrupted 15 years of habitation aboard the international complex. This record stands to date as the longest continuous human habitation in space and continues to pave the way for future multi-year missions to Mars. Marking 15 years of continuous ISS habitation, Expedition 45 Commander, Scott Kelly (NASA), along with Year in Space counterpart Mikhail Korniyenko (RSA), were joined by their fellow crewmembers Oleg Kononenko (RSA), Kimiya Yui (JAXA), Kjell Lindgren (NASA), and Sergey Volkov (RSA) to mark the anniversary. But arriving at this day was not a path taken without hardship. 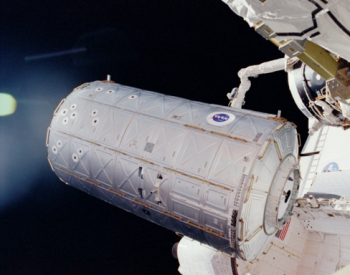 The birthing pangs for the International Space Station in the 1990s were especially difficult, as budgetary constraints within the US federal government as well as the Russian federal sector constrained and eliminated portions of the Space Station that had originally been envisioned as part of the grand design for the orbiting laboratory. When construction finally began in November and December 1998, it was anticipated that the Station would be completed by 2006. However, the tragic loss of Columbia on 1 February 2003 grounded the Shuttle program for 2.5 years and effectively ceased construction of the Station from November 2002 (Endeavour, STS-113) until September 2006 (Atlantis, STS-115). The intervening fallout from the loss of Columbia also necessitated a reduction in the number of crew living aboard the ISS from three to a safe minimum of two – due in large part to the loss of upmass from Shuttle needed to ensure three person operation for the Station. The Columbia loss also permanently shifted the Space Shuttle Orbiters away from primary Expedition crew rotations to construction and outfitting missions with interspersed single crewmember rotation flights from STS-121/Discovery (July 2006) until STS-129/Atlantis (November 2009). With STS-121/Discovery, the ISS crew was returned to a three-person size before the much anticipated expansion to an operational crew size of six on 29 May 2009. But importantly, 15 years of continuous habitation aboard the ISS would not have been possible without the work of all previous ISS Expeditions, Russian Progress resupply and Soyuz crew rotation missions, Commercial Dragon and Cygnus resupply efforts, and – perhaps most importantly – the 37 flights of Discovery, Atlantis, and Endeavour to construct and outfit the International Space Station. But truly, it all goes back to the very first long-duration mission to ISS: Expedition 1. Following the start of construction operations in November/December 1998, by October 2000, the ISS was finally ready for its first resident crew. This first crew, Expedition 1, was chosen as an international team from the beginning. Having worked out a rotating command structure in which command of the International Space Station – in its initial years – would pass from NASA to Russia in alternating Expeditions, the two agencies agreed that NASA would have the first command of the Space Station. Thus, William Shepherd was chosen from NASA with Russia choosing Sergi Krikalev as Flight Engineer for the ISS Expedition and Yuri Gidzenko as pilot for Soyuz operations as well as a Flight Engineer for the ISS. Launching from the very same launch pad that Yuri Gagarin used for the historic first human mission to space on 12 April 1961, the Expedition 1 crew launched on 31 October 2000 at 07:52 UTC from Gagarin’s Start at the Baikonur Cosmodrome in Kazakhstan aboard the Soyuz TM-31 spacecraft. 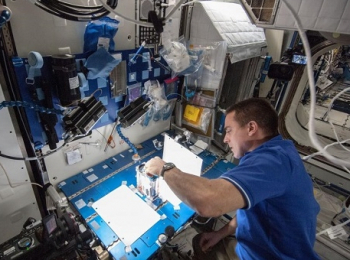 A 33-orbit, two-day rendezvous trajectory brought the crew to the vicinity of the ISS. Arriving on 2 November 2000, Gidzenko guided the Soyuz spacecraft to a picture-perfect docking on the aft port of the Zvezda Service Module at 09:21 UTC, officially marking the start of the Expedition 1 crew’s tenure at the ISS – and officially beginning the to-date uninterrupted period of habitation of the ISS. Following entry into the Station, the Expedition 1 crew spent their time activating computer control and critical life support systems and unpacking supplies left for them by previous Shuttle and Progress supply missions. However, several things did not go completely to plan. Initially, the Expedition 1 crew was tasked with activating the food warmer in the Zvezda module – a task anticipated to take 30mins. It took a day and a half. Likewise, the docking of Progress M1-4 on 18 November initially failed when the Progress’s automatic docking system did not work. ISS Flight Engineer Gidzenko had to manually dock the craft using the Station’s TORU (Teleoperated Mode of Control) docking system. Additionally, unique to Expedition 1, the Space Station’s power generation capabilities from the solar arrays it had in the first month of Expedition 1 were not sufficient to heat all three modules of the Station at the time. Therefore, the crew was unable to use the U.S. Unity module in their first month aboard the Station. That aspect of the Expedition 1 mission finally changed with the arrival of STS-97 and the Space Shuttle Endeavour on 2 December 2000. During STS-97, the Endeavour crew brought the first pair of U.S. photovoltaic solar arrays to the Station – thereby greatly increasing the Station’s power supply. 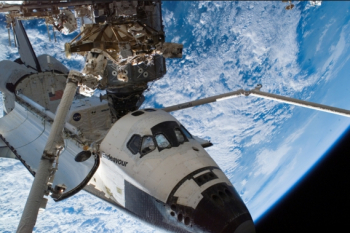 Endeavour also delivered over 17 tons of supplies to Expedition 1 and the ISS. 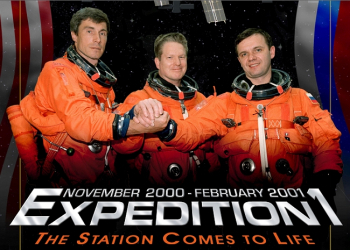 Following Endeavour’s departure, Shepherd, Krikalev, and Gidzenko, at the transition from December 2000 to January 2001, became the first three humans to mark the passage into a new century and millennium while living and working off world. Throughout January 2001, the Expedition 1 crew continued to work through outfitting operations on the Station while performing science experiments aboard the orbiting laboratory. On 9 February 2001, the Space Shuttle Atlantis on the STS-98 mission delivered the 16 ton U.S. Destiny laboratory to the Station. 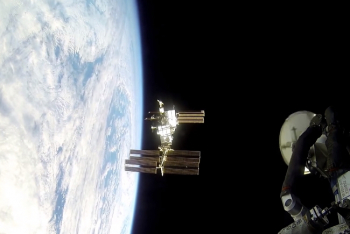 The delivery of the Destiny lab took the ISS’s total mass above that of the Russian Space Station MIR’s. This was followed by a visit from the Progress M-44 vehicle at the end of February with additional air, food, rocket fuel, and other equipment for Expedition 1. Finally, Expedition 1 was joined on 10 March 2001 by the Space Shuttle Discovery on the STS-102 mission – thus marking the beginning of the end for Expedition 1. Part of the STS-102 Discovery mission was a crew exchange from Expedition 1 to Expedition 2. 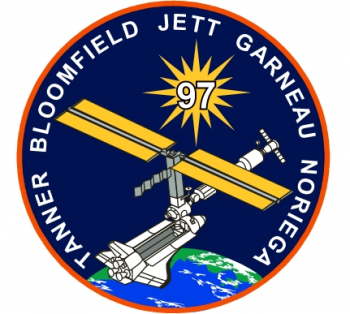 For the crew of Expedition 1, their official tour of duty on the International Space Station ended on 19 March 2001 at 04:32 UTC when the Shuttle Discovery undocked from the Station. After 141 days in space, the Expedition 1 crew landed aboard the Shuttle Discovery on Runway 15 at the Kennedy Space Center, FL, on 21 March 2001. To date, 45 crewed Expeditions have lived aboard the International Space Station in the 15 years since Expedition 1 began. In that time, more than 1,200 scientific publications have been produced based on experiments and results obtained by crews aboard the ISS. Those publications have resulted from the more than 1,760 research investigations from more than 83 countries that have so far been conducted aboard the Space Station – the very first of which was a protein crystal growth experiment that occurred before permanent human habitation began. That very first experiment aided the treatment of diseases and disorders on Earth such as Duchenne Muscular Dystrophy. Moreover, all of these scientific experiments, including the 22 conducted by Expedition 1 as well as the 191 currently being conducted by Expedition 45, have occurred from bio-medical research on the Station crew members themselves as well as within the 29 research racks – including 15 external experiments – that have inhabited ISS throughout its life. In this manner, the Space Station has been a true international endeavor, with global cooperation from more than 220 people from 17 countries who have lived on, worked in, and visited the ISS since 2000. Overall, the Space Station Program has involved more than 100,000 people in space agencies and at 500 contractor facilities across 37 U.S. states and 16 countries. Importantly, an estimated 42 million students across the Earth have benefited from educational activities conducted aboard the orbiting laboratory. But it is not just the scientific and educational return from the investment of the International Space Station that is the focus of work being conducted aboard the laboratory. As NASA and its international partners look toward placing human beings on Mars by the 2030s and 2040s, work currently being conducted aboard the ISS is providing NASA a pathway toward Mars. In this way, NASA has invested physical, psychological, and technological-based research into the crews aboard the Space Station. Specifically, one of the primary challenges for all space missions until recently has been the need to anticipate and bring every possible item needed with a crew from launch. However, cutting-edge technology that now allows for the 3-D printing of tools and equipment is changing the way NASA thinks about what needs to be launched with a crew versus what a crew can manufacture in space. To this end, NASA invested in the launch of a 3-D printer to the International Space Station, which to date has allowed astronauts to print over 20 objects with 13 different designs, including a ratchet wrench, for use in various daily activities and maintenance operations for the Space Station. In this manner, astronauts aboard the ISS – for some items – no longer have to wait for the item to be manifested for a future launch, sometimes months away, and then for that launch to occur and for the vehicle to rendezvous with the Space Station. Moreover, the Water Recovery System (WRS) aboard the Space Station has helped NASA understand the nuances of reclaiming water from various sources for potable use instead of relying solely on shipments of water from the ground. 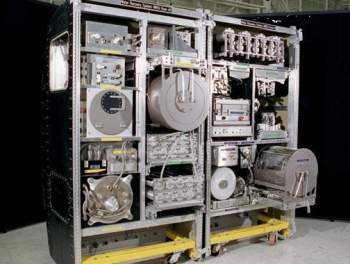 Since its introduction to the ISS, the WRS has helped reduce crew dependence on cargo resupply water by 65%, thus serving as a stepping-stone to deeper space exploration missions. But these are not the only ways the International Space Station is helping NASA and its partner agencies prepare for coming human missions to Mars. The Space Station provides excellent opportunities to understand communication delays, understand astronaut functional performance issues, and importantly understand the psychological impacts of isolation and confinement. 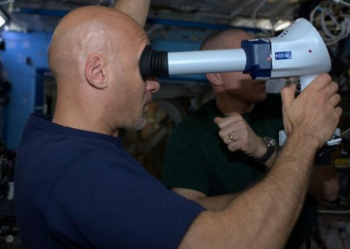 Moreover, the Station allows NASA to understand how astronauts’ vision is affected by long-duration spaceflight as well as how their immune responses are altered by long-duration stays in a microgravity environment. Additionally, understanding what types of foods are best for long-duration missions and how those foods could potentially be grown in space is another way in which the Space Station is currently helping long-term plans for the future of space exploration. 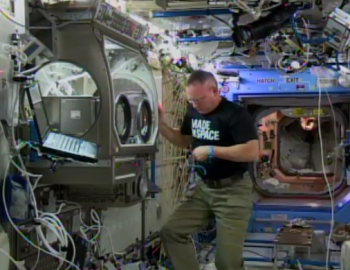 And the Station will continue to provide invaluable understanding of human-space interaction for years to come. 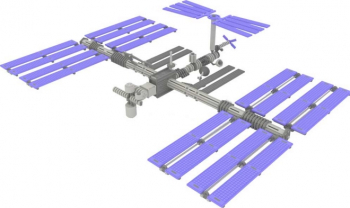 Current plans call for the continued funding and full-scale operation of the International Space Station through 2024 from both the United States and Russia despite the continued strained relations between the two countries on the ground – highlighting yet another important aspect of spaceflight aboard the ISS. (Images via NASA and ESA).